February 8, 2019 – After nearly a year of sitting dormant, Kings Dominion announced that Volcano – The Blast Coaster, the one and only Intamin Suspended Catapult Coaster ever built, will be removed after 20 years of operation. Known for its dual launches, especially the second one that propels the train out of the top of the structure, the coaster remained a guest favorite ever since it opened on August 3, 1998. 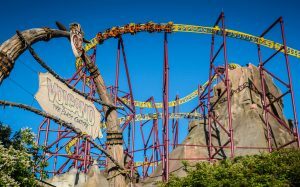 That doesn’t necessarily mean it wasn’t a problematic ride, as it was know to suffer from capacity and downtime issues, which the park cited among the reasons for the closure. We hope you had the chance to ride as it was truly a fun and unique coaster the likes of we’ll never see again. We’re hard pressed to come up with another coaster that people were willing to continuously stand in such a long line to ride and it was always worth the wait. This entry was posted in News and tagged Doswell, Kings Dominion, removal, Virginia, Volcano. Bookmark the permalink.